With Andrea's excited return to school yesterday, life feels like it's returned to normal. Which is wonderful and familiar. To celebrate the advent of fall... even though our Indian summer days remain over 90 degrees... 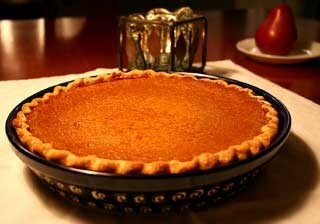 I baked a fragrant pumpkin pie for last night's dinner. It was soothing and delicious with hints of cinnamon, ginger and cloves, just like comfort food should be.